The proposed University of Regina bus pass was a hot topic at City Hall on Wednesday and the CBC's Arielle Zerr was there. She says u-pass will benefit more than just students. Put less cars on the road, less traffic and gives people more frequent bus stops. Also the Owl, Peters says. Hawkins asks how URSU gets funding, just student fees? Mayor: what happens if the fee is over $90? Peters: I don't think the fee can be higher than $90. 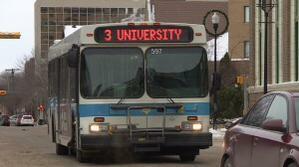 U of R u-pass would be a bit higher than u of s. #yxe students, what do you pay for u-pass per semester? Everyone has the same vote, no side could have organized to try to ensure their side won, organizer says. Hawkins: Are you concerned that with no no side organized for the referendum that still 46% voted no? Delegate from student group who represented yes side of referendum says U of S saw 40% increase in ridership after u-pass went through. Student Union prez up now.